CINCINNATI -- John James Audubon would be all over the upcoming "Off the Page" art exhibit at the Lloyd Library . It brings together three touchstones of the great 19th-century artist's life: illustrations of nature, taxidermy and his one-time hometown of Cincinnati. While the exhibit lacks in a marquee name like Audubon, it flourishes with the kind of fascination Audubon created for the 1827-39 editions of his seminal work, "The Birds of America." "Off the Page" combines the scientifically important insect illustrations of German-born Maria Sibylla Merian (1647-1717) with the American taxidermy of Covington-based Jeremy Johnson. Audubon, who painted and created taxidermy for displays at Dr. Daniel Drake's new museum here in 1819-20, would be impressed to see how a Cincinnati institution has brought his two talents together in the collaborative work of artists who lived 300 years apart. "We use that Audubon connection in the description of the show to remind people, to kind of give them an idea of what the show will look like," said Johnson, who calls his taxidermy studio Meddling with Nature . Johnson is in the throes of recreating about 20 of Merian's colorful, lifelike illustrations in three dimensions, which will be installed just days before "Off the Page" opens with an evening reception at the Lloyd Library on March 24. They range from small ones, such as a harlequin beetle on a citrus fruit called etrog, to large ones such as a caiman wrestling a snake. Johnson had to search the world for the right supplies, but ran into an occasional snag. Take, for instance, the snake in the caiman illustration. It is a coral snake that's way longer than the ones in real life, so Johnson located a substitute: a similarly colored hognose snake. All but one or two of the illustrations that inspired the self-taught Johnson to mount the show with the Lloyd were culled from 60 presented by Merian in her 1705 large (or "elephant") folio book "Metamorphosis Insectorum Surinamensium," which was donated to the library by the son of its founder, Cincinnati pharmaceutical chemist John Uri Lloyd (1849-1936). Johnson discovered Merian a couple of years ago on his first hunt at the Lloyd Library for resources that would help him in his work. He found her illustrations "eye-catching" and "fantastic." The idea for the exhibit evolved out of the library's growing desire to draw people in through related art exhibits, said Betsy Kruthoffer, rare books cataloger and exhibit curator. "Off the Page," Johnson said, is "kind of a perfect storm." This January gave rise to nationwide women's marches and it was also the 300th anniversary of Merian’s death. Now, several months later, Women’s History Month is observed across the country. 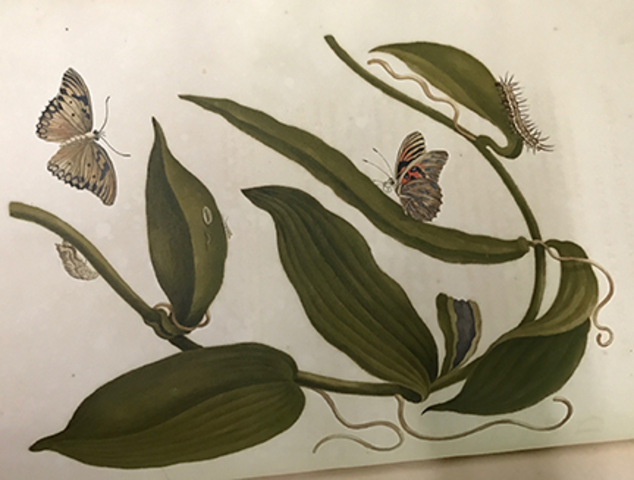 At the March 24 reception, Johnson will demonstrate how he preserves insects, talk about Merian's personal and sociopolitical life, describe her illustrations and how she made the pigments she used to color them, as well as field questions. He said he is prepared, as he always is when he gets before a group, to mix education and entertainment in a unique way. 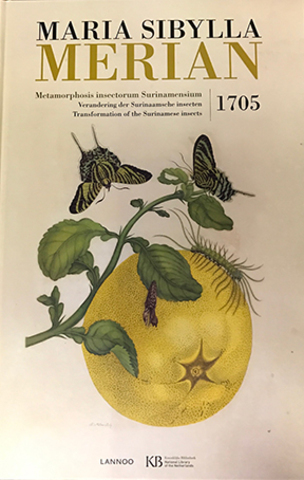 The story of Merian's unusual life should captivate those who have never heard of her, Johnson said, and hopefully connect them to the Lloyd Library as a unique resource in North America. Locals may not know about it, he said, but scientists around the world do. "I have no doubt that this show will be picked up nationally," Johnson said. "It would be really good for the Lloyd." Articles about Merian in The Atlantic last year and The New York Times this year support his prediction. Johnson said he worked on the exhibit in stages. He grew plants from seeds, conducted research, preserved his once-living subjects, created what he could not find (the etrog is made of wax), wrote descriptions and did the required graphic arts. Some pieces of the exhibits took hours of hands-on work to complete, while others took days. The time Merian put into her elephant folio took years and showed the doubting scientific world that insects did not "spontaneously generate" and crawl out of the mud; instead, as we know now, they went through several cycles of life called metamorphosis. Merian was the first to document, both in writing (Latin and Dutch) and illustration, that butterflies and moths develop in four distinct stages: egg, larva, pupa and adult. But her scientific discoveries and self-publishing feats weren't Merian's only unusual accomplishments. Born in Frankfurt, Germany, she was well-educated and influenced greatly by her father, who was an engraver and publisher, and her step-father, who was a still-life painter as well as a champion of his daughter's foray into an unusual world inhabited exclusively by men. Merian's early marriage produced two daughters: Johanna Helena Holt and Dorothea Maria Graff. The three worked as a team and when Merian was 52 in 1699, she and Dorothea sailed to Surinam, a colony on the northeastern coast of South America that the English traded to the Dutch for Manhattan. Johnson said he found Merian's story, especially that 5,000-mile journey and subsequent adventures into the dangerous and rugged rainforest, to be "bizarre" -- the good kind of bizarre. That she took such a risk "is one of the things that makes it such a fascinating story," he said. Kruthoffer is also smitten with the Merian's tale and the fact that she was more than 100 years ahead of illustrators and naturalists such as Audubon. "She didn't draw scenes (like Audubon)," Kruthoffer said. "What she tried to show were insects in all their stages of development on the plants they lived and fed on. I think she was the first to put this (life cycle) in this context." Kruthoffer said she is also amazed by Johnson's work and his knowledge of anatomy, botany and preservation. "He's completely self-taught. … I don't know how anybody would start doing this kind of thing," she said. "I think it's really cool that he came here and saw these books, and they set him off onto a project about them." An opening reception for “Off the Page” will be held from 5:30-8:30 p.m. March 24. The exhibit runs through July 31 at the Lloyd Library, 917 Plum St. Hours are 8:30 a.m.-4 p.m. Monday-Friday and 9 a.m.-4 p.m. every third Saturday from September through May. For holiday closures and information, visit the library’s website. 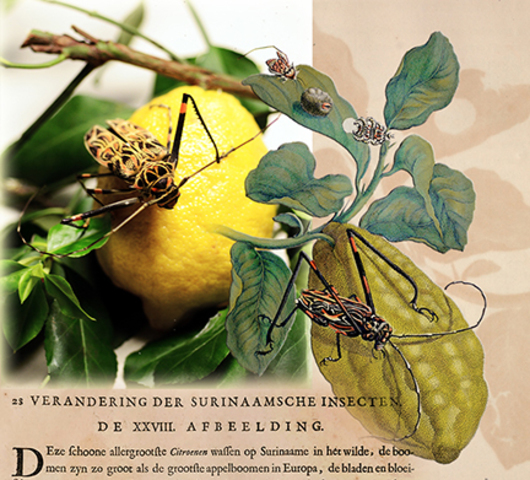 The exhibit includes a reproduction of "Metamorphosis Insectorum Surinamensium" for guests' perusal. The "double elephant" folio (435 plates measuring 21.5 inches by 39.5 inches, divided into four volumes weighing 40 pounds) of John James Audubon's "The Birds of America," which were purchased from Cincinnati philanthropist Joseph Longworth in 1870 by the Public Library of Cincinnati and Hamilton County , are on permanent display in its third-floor Cincinnati Room. They can be viewed online here .